Have you gotten hooked on the Rising Storm series yet?! 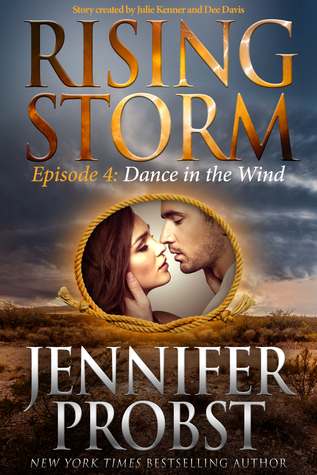 This serial is full of sexiness, scandal and suspense and late last week, the fourth episode in the series hit ereaders—Dance in the Wind by Jennifer Probst!!! I’m so excited to share a sneak peek at this installment, plus, make sure to scroll to the bottom to enter to win a paperback set of Episodes 1 through 3!!! Ginny suddenly stepped forward, a tentative smile on her face. Travis immediately let go of Celeste’s elbow and reached for Ginny, his expression paternal. Celeste’s face lit up a bit too as she stood by, as if some of her troubles were eased just by being in Ginny’s presence. Logan knew what that felt like. The sucker punch happened low in his gut. A pleasant, warm feeling trickled through his veins. Damn, he felt like he was in some chick flick movie, but he’d never experienced such a chemistry with any other woman, not like this. “Welcome home, Logan,” she said softly, her words echoing their talk in the park. He stared at her beautiful face, glowing with her pregnancy. Smooth, golden skin. Those wide dark eyes, so full of mysteries and secrets he wished he could delve into. Curly black hair tumbling over her shoulders. Tonight, she wore black pants and a simple black lacy top that stretched over her small breasts. Her lips were a deep red. Logan tried not to stare at that mouth, which looked lush and ripe like a Red Delicious apple he wanted to bite into. Her belly only showed a tiny bump, confirming Jacob’s baby was growing inside her body. What was wrong with him? He’d imagined being a bit disgusted by himself for being attracted to a pregnant woman, but in his heart, he only recognized Ginny. The girl he’d grown up with. The girl with the hearty laugh and sparkling eyes, and impish trouble she’d get into with her friends. In the years he’d been away, she’d changed. Ripened. There were regrets and secrets in her eyes that called to him, because he had his own. It was almost as if they were soul mates, finally reunited. Of course, that was crazy. He must’ve been staring at her for a while because Celeste frowned. He forced himself to speak. “It’s good to be home. How are you feeling, Ginny?” Logan craved a more intimate conversation, but Celeste seemed to keep a protective eye on her house guest. Ginny winced. Was she embarrassed to be carrying Jacob’s son? Or was it just hard to hear his name spoken aloud? Logan wondered how deep her grief went. He ached to hold her gently in his arms and take care of her. He was sure the Salts gave her what she needed, but he also knew about the downfalls of a small town, especially Storm. The town loved their gossip, and judgment. She loves hearing from readers. 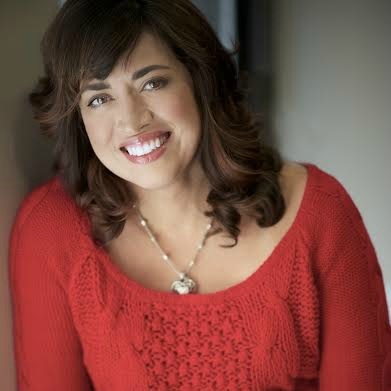 Visit her website for updates on new releases and her street team. Sign up for her newsletter for a chance to win a gift card each month and receive exclusive material and giveaways.